Program your robot to follow a black line over a white surface. Availability: 68 In Stock. Backorder available. This kit provides more design flexibility--you can also use it to program your robot for light sensing. Compatible with VEX Cortex Microcontroller and Flowol 4 software. Function: A line tracker mostly consists of an infrared light sensor and an infrared LED. It functions by illuminating a surface with infrared light; the sensor then picks up the reflected infrared radiation and, based on its intensity, determines the reflectivity of the surface in question. Lightly colored surfaces will reflect more light than dark surfaces; therefore, lightly colored surfaces will appear brighter to the sensor. This allows the sensor to detect a dark line on a pale surface, or a pale line on a dark surface. 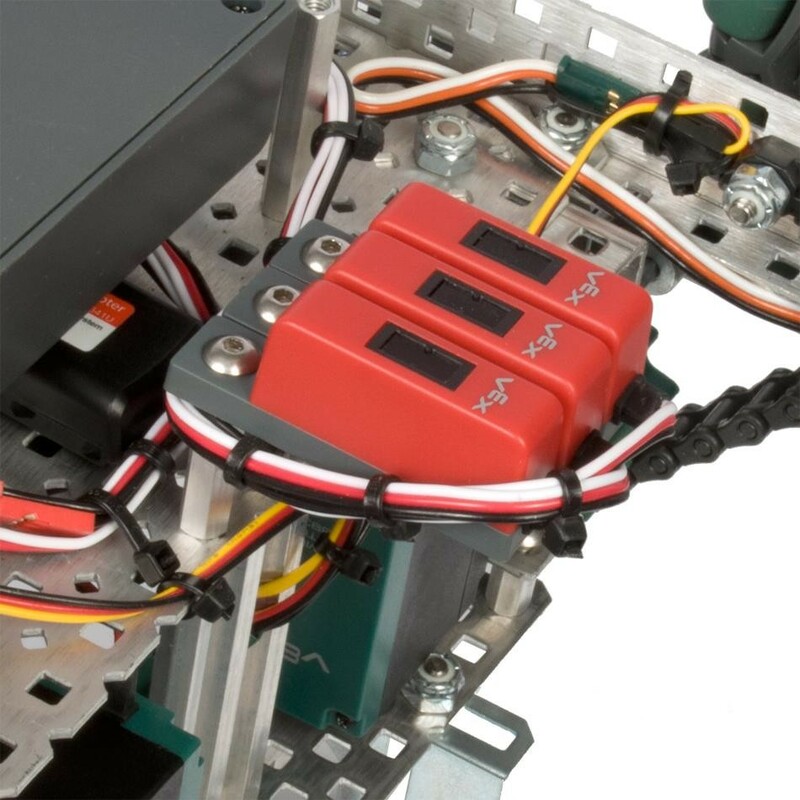 Applications: The line tracker enables a robot to autonomously navigate a line-marked path. By drawing a line in front of a robot outfitted with a line tracker, one can dictate the robot’s patch by showing it where to go without using a remote controller. A typical application uses three line trackers, with the middle sensor aligned directly above the intended line. Compatibility: VEX Cortex Microcontroller and Flowol 4 software, 3-Wire Extension Cables. Input Type: Light reflected from dark lines and a bright floor. 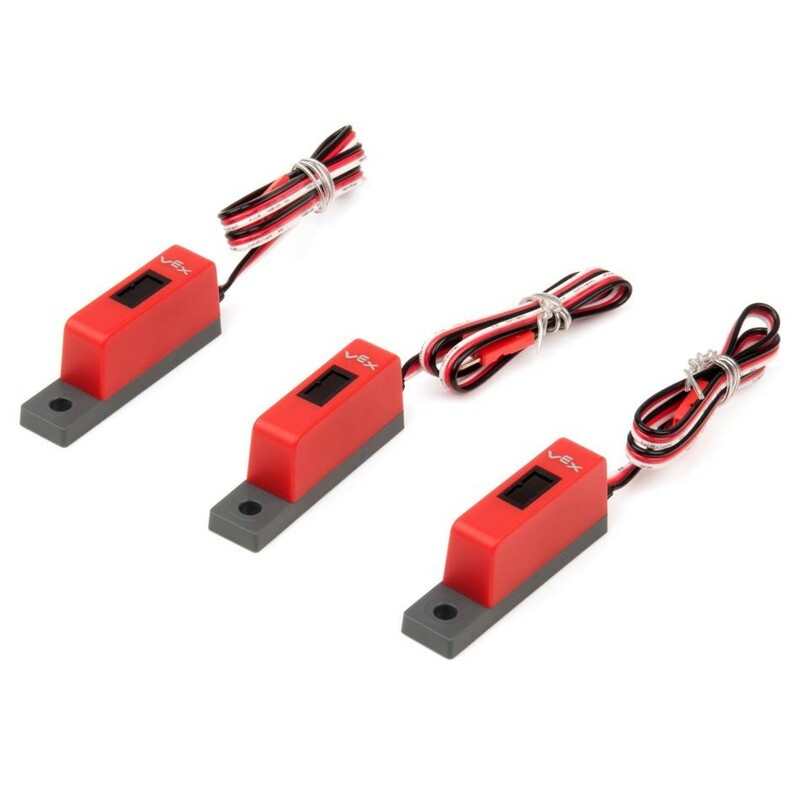 Sensor: Infrared light sensor and infrared LED. Line Width: 0.25 in. minimum, optimal line width is 0.5". 3-Wire Cable Connect to three analog inputs. Line follower sensor weight: 0.034 lbs (15.4 grams).